Reading is the best way to improve your writing. Reading is a long-term investment. You need to become a writer now. You can’t wait until you’ve read scores of classic novels. Luckily, there’s a way for you to enhance your writing immediately. It’s called The Hemingway App. We’ve recommended it before, but there are many entrepreneurs who haven’t tried it. It’s a one-of-a-kind tool for content marketers who need to write clear and fluid sentences for the web. Using the Hemingway App is a quick and free way to experience a breakthrough in your writing. The Hemingway App eliminates dead weight from your writing. You can buy it from their official website for $9.99, and it’s compatible with Mac and PC. Better yet, it supports markdown files, which many WordPress bloggers find useful. You can use the online version for free, although you can’t save or export files. But, it’s still software, meaning it’s prone to machine-like suggestions. Blindly following its suggestions will make your writing better. But who wants “better” when “much better” is within reach? The way to get the most out of the app is to break the rules sometimes. 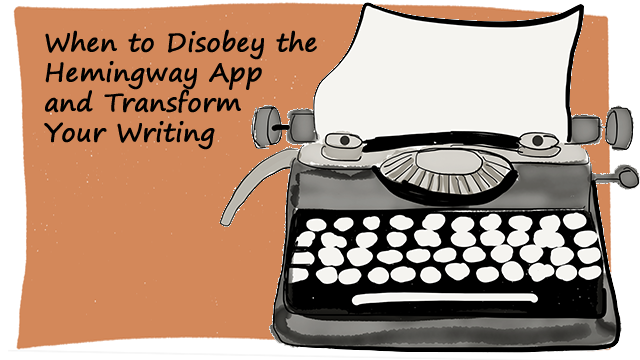 So when should you break the rules of the Hemingway App? Eliminating useful tools from your toolbox isn’t the answer. Even if you use a Flathead screwdriver less frequently than you do a Phillips Head, you still want both screwdrivers in your drawer. So when should you ignore the advice of the Hemingway App so you can squeeze the most out the application? The Hemingway App highlights adverbs in blue, suggesting you remove many of them from your writing. Many pro writers rail against adverbs. One reason adverbs are disparaged is because of redundancy. Strunk and White’s Elements of Style, considered one of the bibles of writing, also frowns on adverbs. Take a look at the following sentence. The Hemingway App suggests you remove loudly from this sentence. It’s the right call. Not because “loudly” is an adverb. You should remove it because it doesn’t add anything to the sentence. The verb “blared” already implies a high volume. Something can’t blare quietly, so “loudly” is an extra word, a clear free-rider. Some adverbs aren’t free-riders like “loudly” in our previous example. Some adverbs are plain weak. The new examples use detailed verbs that make your writing vivid. We’ve also cut down on extra words. These are two marks of effective writing. 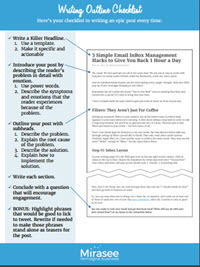 Want our formula for writing epic blog posts? This article is about breaking rules. When can your adverbs stay? Look at the words marked blue by the app. If the adverb adds nothing to the verb, then delete it. If the adverb adds something to the verb, look for a more detailed verb. If you can’t find one, then keep the adverb. The Hemingway App highlights phrases in green to mark the passive voice. Writing experts like bashing the passive voice. But blanket enmity is usually an oversimplification. The active voice isn’t always better than the passive voice. First, let’s do a quick review in case you need to jog your memory. The sailor discovered the treasure. The active voice is the default option for professionals. It’s the safe choice. That doesn’t mean it’s always the right choice. Sometimes, the passive voice is better than the active voice. This antique museum was built in 1900. Random Construction Corp built the antique museum in 1900. In this case, the passive voice is the right choice. The museum is the star of the sentence. If the subject is inconsequential, then you’re better off with the passive voice. Sometimes the agent of the sentence is important, but you don’t know who it is. The active voice may spotlight either an unknown subject or one that’s not important. In that case, keep the passive voice. You can find lots of success with either the active or passive voice. However, the passive voice has the extra risk of being ineffective or inappropriate, while the active voice does not. In other words, the active voice is the safe choice. But if you aren’t sure about your subject, then eliminate those green highlights. The Hemingway App highlights complex words in purple and suggests simpler ones. It seems counter-intuitive, but in some cases, complex words can make you sound less intelligent. A 2005 Stanford study by Daniel M Oppenheimer proves this. Long story short, students concluded other students who used simpler language were smarter. When is it okay to use complicated words in writing? It depends on your audience. Jargon that’s appropriate for one audience might not be appropriate for another. For instance, take the word “lede.” It’s a term journalists coined to mean the lead-in or opening paragraph. If you’re writing to journalists, “lede” is okay. But what if you’re a high school science teacher giving instructions for the opening paragraph of a written report? Then you should probably replace “lede” with a word your students understand. Use the language of your audience. The Hemingway App rarely assists with that kind of jargon anyway. In fact, the application doesn’t highlight in purple all that often. It’s probably the rarest of the five colors. It also highlights more small words than you would expect. Here are some examples. Here are the changes it recommends. These are some of the safer edits you can make. If you can use fewer words or a simpler word, and retain the same meaning, then do it. Variety is vital in writing. You don’t want to overuse words, even if they’re simple ones. Don’t be afraid to sprinkle in lengthier phrases to add variety. That being said, use the simpler words first and more often. The Hemingway App has five colors. The last two we haven’t covered are yellow and red. Yellow is a hard-to-follow sentence, and red is a very hard-to-follow sentence. The application determines these colors based on sentence length, vocabulary, and syntax. Writing aces love to bash long sentences. But when are they acceptable? When is it okay to publish copy with red and yellow highlights? If you write in the law, medicine, engineering, or another complex field, then your writing is going to have jargon. The Hemingway App penalizes you for that, marking up those types of sentences in yellow and red ink. Sometimes there’s no simpler way to say exactly what you want to say. What if you aren’t writing about something technical? Is it ever okay to have copy with red highlights? But the short sentence can become boring. Breathtakingly boring. It can become repetitive. Monotonous. Monotone. Routine. And dry. Which frustrates the reader. As you can see, overloading your paragraphs with short sentences isn’t the answer either. You need to have balance in your writing. Medium and long sentences give the short ones more impact. Don’t think all sentences without jargon marked in red are hard to follow. Here’s a sentence the Hemingway App marks in red, even though it’s easy-to-follow . If your sentence has high readability, then ignore the red or yellow recommendations. But if you’re uncertain, change it into a simpler sentence. “There is no rule on how to write,” Ernest Hemingway once quipped. As you’ve seen in the examples above, following all the writing rules won’t make you a great writer. There are times when you need long sentences, the passive voice, complex phrases, and adverbs. Keep in mind, the app even highlights Hemingway’s own sentences. Top-tier writing isn’t found in strict rules; intuition is vital too. That’s why reading is still the best way to improve your writing. Consuming well-written literature will hone your instincts and sharpen your hunches. It will give you an ear for great sentences. Still, the Hemingway App is a superb starting point for newbies and many old hands as well. Use the tips above to extract all you can out of it. Do you use the Hemingway App? Do you know a rival app that is better? Perhaps you know a writing app that complements the Hemingway App. Tell us about it in the comments. 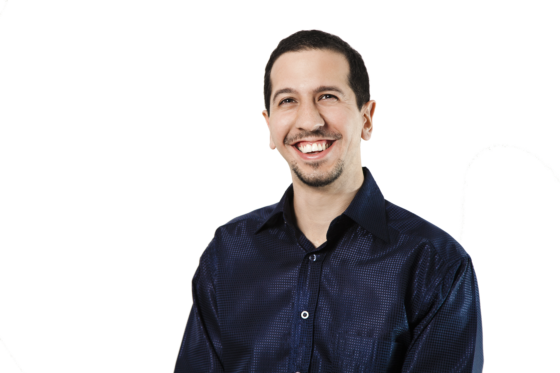 Zachary Moore is a freelance writer who writes about digital marketing. You can find him at his website and on LinkedIn. The Hemingway Editor really great for highlighting common problems that can get in the way of clear writing such as Complex words or phrases, Extra-long sentence, Long sentences, Too many adverbs and Too many instances of passive voice etc. The Hemingway app is great and the chrome Orwell App is even better because it’s embedded in the browser. This makes editing WordPress articles much easier. Eventually, thanks for reveling a light on amazing topic. Thanks for sharing the Orwell App. Does the Orwell App have a Firefox version? Thanks for this, very helpful article. How does Hemingway compare to Grammerly? The Hemingway App works best in the copyediting stage. It helps you edit for style. Grammarly is strongest in the next stage, the proofreading stage. It helps you check your copy for spelling and grammar mistakes. They are both great tools that work well together. Are you currently using Grammarly? I would like your opinion on it. I do use Grammerly for the exact reason you mentioned – proofreading. The free version is too minimalist so I opted for the paid version. I will however be adding Hemingway to my process.